Johnny Depp's 40th birthday last month might have been an excuse for the mother of all parties, perhaps at the Viper Room, the Los Angeles club that he co-owns. Maybe he would have finished it off by trashing a hotel room, or chasing the paparazzi down the street while waving a piece of wood. Both of these are ways previous nights out have ended for him. But this year he celebrated in a rather more sedate fashion. But music isn't his sole refuge any more. Instead, the man who was famous for hellraising, and for dating some of the world's most beautiful women, including Kate Moss and Winona Ryder, has renounced his wild ways and now swears by the virtues of family life. For the past five years he's lived quietly with the French pop singer and actress Paradis in the south of France, along with their two children Lily-Rose Melody, four, and Jack, one. He met Paradis in a Paris restaurant in 1998 while filming Roman Polanski's supernatural chiller The Ninth Gate. “It's like somebody took the blinkers off, or cleared the fog out,” he says. “I remember when Vanessa was pregnant with Lily-Rose and I was awaiting parenthood, I suddenly knew then and there what life was all about. “Finally, at the age of 35, when my child arrived, it all became clear to me. I thought, ‘I've been dumb for the past 20 years. My life starts now.’ The children haven't mellowed me, but they've grounded me and given me a strength, a focus and a calm that I did not have before. Depp spends most of his time in France, although he still owns a house in Los Angeles, and now has a vague Gallic intonation to his slow, measured speech. He has a famously erratic dress sense and turns up in a blue woolly cap, blue tartan shirt, green waistcoat and blue pinstriped trousers. There are skull rings on his fingers, brightly coloured plastic bracelets on his wrists, and a Che Guevara pendant around his neck. With shaggy, bleached hair, goatee and two gold teeth (they were capped for filming and he's yet to have them removed), Depp looks rather gypsy-like. But no matter how hard he tries to deflect attention from his looks with bizarre clothes, he can't hide the extraordinary cheekbones that are his most striking feature. He smiles constantly, so that he seems almost too pleased with himself, smokes thin rollups, and says that he couldn't be happier living far away from Hollywood. But Hollywood hasn't forgotten him. This is a testimony to Depp's enduring appeal because, while he has an extremely loyal fan base, he has never appeared in the blockbusters and mainstream romantic comedies that are now the mark of success in the film industry. 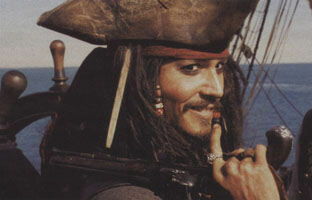 In fact, apart from 1999's Sleepy Hollow, Depp has never starred in a big hit. Instead, he's concentrated on quirky, unconventional characters in uncommercial films such as Ed Wood, What's Eating Gilbert Grape, and Don Juan DeMarco. That lack of commercial success should change with his latest film, Pirates of the Caribbean. Despite its origins as a Disneyland ride, it's an entertaining romp, and Depp gives the funniest performance of his career as down-on-his-luck pirate captain, Jack Sparrow. Staggering like a drunk and with his hair and goatee twisted into dreadlocks, he spends much of the film cracking laconic one-liners in a semi-cockney drawl, and he effortlessly dominates a cast that includes Geoffrey Rush, Keira Knightley and Orlando Bloom. Depp is known for drawing on unlikely figures as the inspiration for the roles he plays. He once told me that he thought of veteran British actress Angela Lansbury when he played Ichabod Crane in Sleepy Hollow. Sparrow, he says, was based on Rolling Stone Keith Richards. It's unusual to see Depp in a Disney film—after all, this is the man who made his directorial debut with the bleak and little-seen 1997 drama The Brave, in which he played a man forced to appear in a snuff film to provide for his family. Was he thinking of his children when he agreed to make Pirates? “Part of the reason was the opportunity to make a film that my children could watch, but they grow up so fast that they'll be able to watch all of my films soon. There's no doubt that Depp is a doting dad—Lily-Rose and Jack were with him throughout the filming of Pirates—but at the same time he and 30-year-old Paradis have no plans to get married. It's no surprise that Depp is a little wary of marriage: after all, he'd been married and divorced, to the little-known Lori Ann Allison, by the time he was 22. His subsequent relationships have been much more high profile. He was engaged to Winona Ryder from 1990 to 1993, and he went out with Kate Moss for four turbulent years. It was after an argument with her in 1994 that he wrecked a New York hotel room, causing a reported $6,000 worth of damage. He spent the night in jail. There were also persistent rumours of drug and alcohol abuse, and these only increased after his friend River Phoenix collapsed and died from an overdose outside the Viper Room in 1993. Depp now sticks to red wine, but he believes that the press got his party-animal persona wrong. “I understand why they wrote it, but I was never a wild, partying kind of person,” he says. “The bad boy label is just something the media stick you with to sell the product. “None of it was ever recreational for me, it was medicinal. To be able to sit in one spot and talk to people, I'd have to be medicated to some degree, whether it was alcohol or whatever. It wasn't nerves, I just felt uncomfortable being a novelty and not having the luxury of anonymity. “I was always a little bit shy, but with the fame, suddenly people were pointing at me and whispering, and that odd feeling I already had was magnified ten times, and you get hypersensitive to it.” Certainly, Depp didn't have much time to get used to being a celebrity. Not long after arriving in LA, he realized that his band were going nowhere and took up acting at the suggestion of Nicolas Cage, who used to let him sleep on his floor. He made his film debut in 1984's A Nightmare on Elm Street, but it was his role as a hip policeman in the television show 21 Jump Street that turned him into a household name in America. Luckily for Depp, he met director Tim Burton soon after the show finished and he cast him in 1990's Edward Scissorhands, the first of three films they've made together, in which he played an isolated young man with scissors for hands. It was the perfect role for Depp, because his fame had ensured that he'd never shaken off the classic teenage feeling of being an alienated outsider. In his case, this was exacerbated by the fact that his early life was hardly conventional. Born in Kentucky to a civil engineer father and a waitress mother, the family moved constantly until his parents divorced when he was 15. 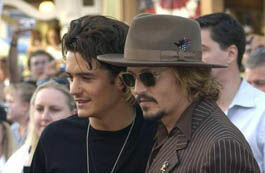 Depp, his sister and mother settled in Florida. That same year, he dropped out of high school to become a fulltime musician. Depp often gives off a sense that he chooses to opt out of participating in normal life, almost on principle. It's clear that he now lives in a bubble that he's developed to protect himself from the effects of celebrity. While he's honest enough to express his opinions, he seems wary of entering into anything. So he'll sound off about the war in Iraq and the way the French have become the whipping boys of the US government, and he is especially scathing about George Bush—“I think he's lucky to have a job”—but he'd never dream of voting. “I think politics is an endless game and I don't get involved because I don't buy the game. I'd rather just step aside from it, you know?” Similarly, Depp will muse for ages on destiny and his belief in some sort of higher power, but you won't catch him inside a church or participating in any sort of religious activity. If he has any regrets, they revolve around some of his film choices. During the mid-Nineties, it seemed as if Depp only took on obscure projects. Few people remember the likes of The Astronaut's Wife, Dead Man and Arizona Dream now, and he acknowledges that he could have abandoned his principles and done the odd big-budget action film. For as much as he has settled down and become the unassuming, contented man that he is now, there is still one thing that's guaranteed to draw out the Depp of old, and that's the paparazzi. In January 1999, he pursued a group of photographers down a London street with a piece of wood in his hands, after they refused to stop taking pictures of him and Paradis. He was arrested and spent six hours in jail, but he has no regrets about the incident.